My final automatic watch I will be writing about is the Seiko 7s36B. I worked on about 12 automatic watches for entirety of my automatic watches section and they were, for the most part an iteration of what I’ve already written about. The bridge architectures may vary a bit, or stop clicks, but for the most part, there wasn’t a lot of differences between the automatics or calendars. Seiko is one of the largest watch manufacturers around. They have been making watches, clocks and other electronics for a very long time (since 1881). Seiko is a really interesting company to me. They make a huge variety of watches in pretty much every pricepoint. Do you want a $50 watch? Search for the SNK793. $300 SRP307. How about a $5000? SBGA011 (This model is quite popular with Seiko enthusiasts). We can get crazy-$350,000. The Seiko Credor Spring Drive Minute Repeater (Model GBLS998) is absolutely gorgeous. 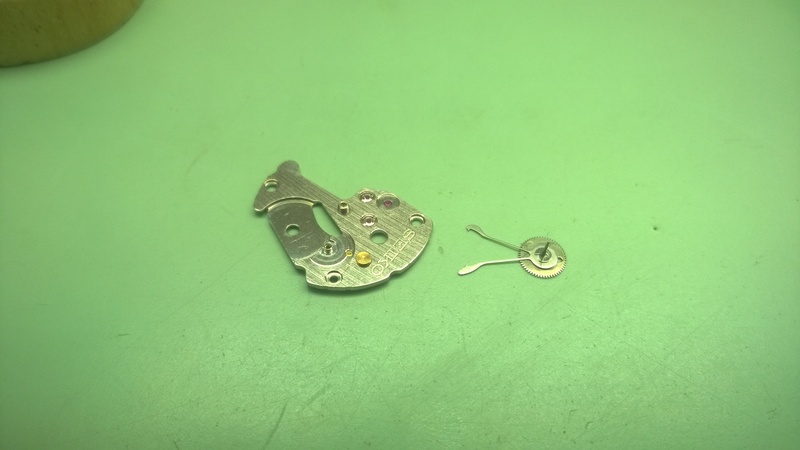 This movement, the 7s36 is very similar to the 7s26 which is in a lot of popular movements (most of the Seiko 5 model watches use the 7s26). The only difference between the two is the jewel count. This watch had a couple of firsts for me-my first day/date and my first non-handwinding watch. 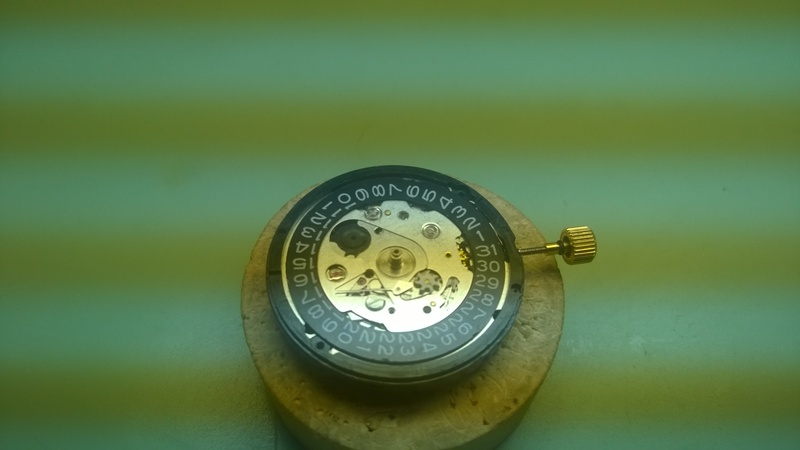 It also had the simplest automatic winding mechanism I’ve worked on. There are a few peculiarities to the watch that I’ll get into, but the focus of this post is going to be on the auto mechanism and the calendar. Regarding the calendar, there is a quick-set function for both the day and the date. The day and date are two separate discs. The day disc is technically called a day star disc. The star disc is held in place by a part called a snap. The snap is the c-shaped piece of metal that is near the base of the hour-wheel. I don’t have a picture of the snap removed, but there is a small indention on the underside at 6:00 to the cut-out. You can use a small screwdriver to gently lever the snap off to remove the star disc. One thing you will notice about the calendar, is there is a lot of plastic that has been used. I’m of two minds on this-first, I appreciate the use of modern materials that can help cut down on friction and lubrication issues. Second, plastic can be fragile and it can look a little cheap. Either way, you take what you get. Once the star disc has been removed, you need to remove the intermediate day corrector wheel and then the date maintaining plate. The intermediate day corrector wheel is the white plastic wheel near 5:00. 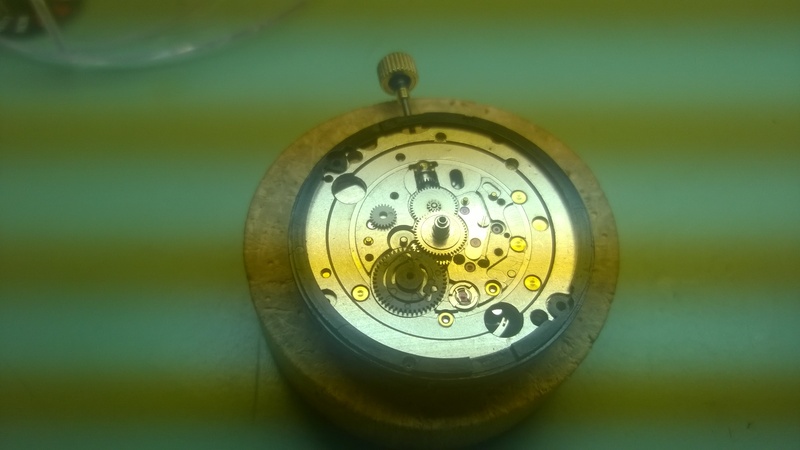 Directly below that, there is a small phillips-head looking screw that Seiko calls a “B” type screw. This plate has a jumper-arm on it to help with the snapping of the day into position. Also, you will notice a small brass looking wheel near what would be the winding pinion on the stem. That brass wheel is attached to the plate and serves as the first quickset wheel. Once the date maintaining plate has been removed, you can remove the date disc. Remember my comment about plastic being fragile? Take a look at the following picture. You will notice that the day/date corrector wheel has a broken tooth. There is any number of reasons as to why the wheel is broken. Improper installation, improper setting of the day or date, etc. 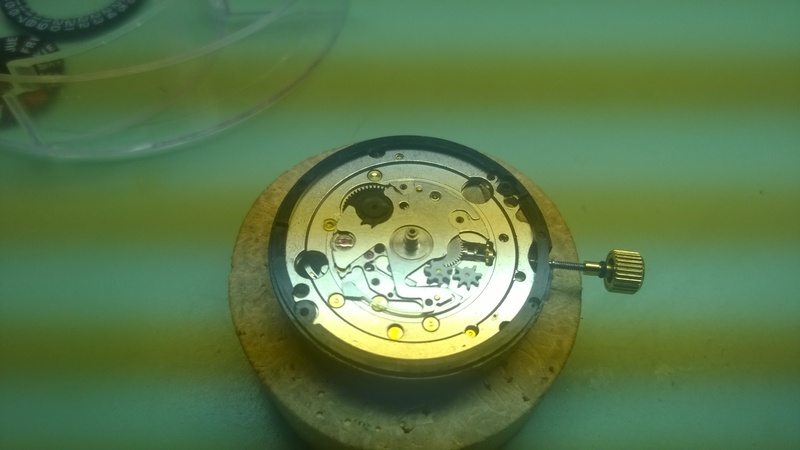 It had to have been broken prior to me getting the watch because there was no tooth to be found during my teardown. This wheel sits in the plate and will engage or disengage the intermediate date wheel depending on which direction you turn the crown. 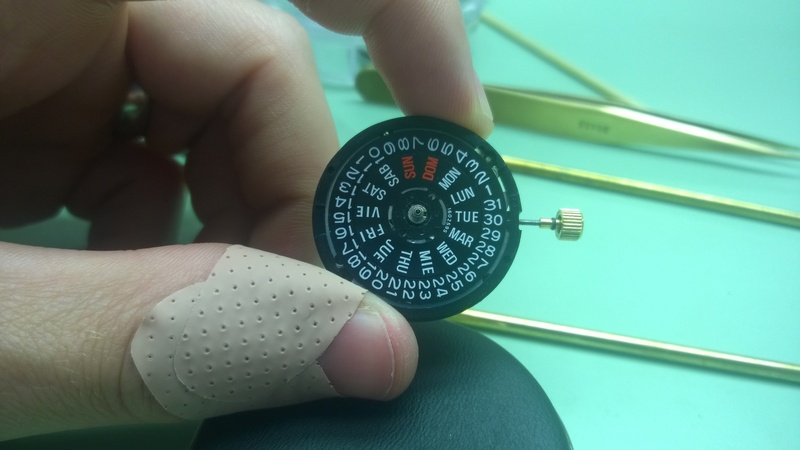 When the first quickset wheel turns clockwise the day/date corrector will turn counter-clockwise and engage the day corrector wheel and change the day. If you turn the crown the opposite way, the quickset wheel will turn counter-clockwise, the day/date corrector will turn clockwise causing the day corrector to turn counter-clockwise. Due to the houndstooth nature of the day corrector, the wheels teeth will not engage with the star wheel of the day disc. Once you have removed the day/date corrector, you need to remove the date jumper plate. After doing that, things start to look pretty similar to other calendars. 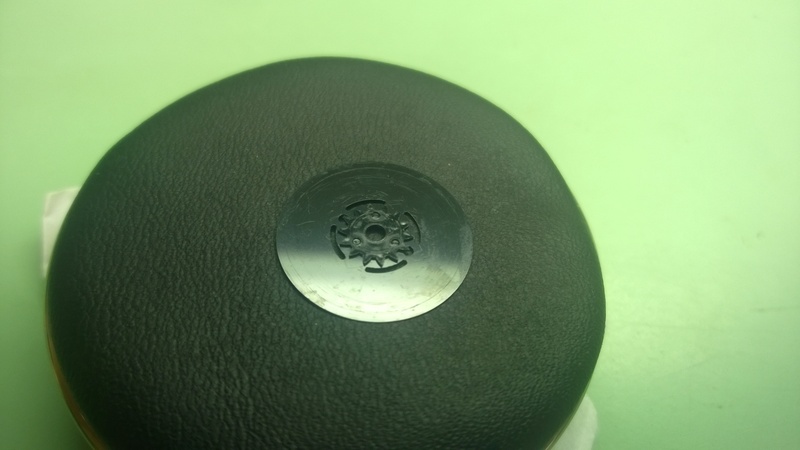 The black disc in the picture below is the date driving wheel. This gets connected to the keyless works via the white plastic wheel that you see sitting on the plate. That wheel is the intermediate date driving wheel. It is in contact with the hour wheel. As the hour wheel turns, it turns the intermediate date driving wheel. The intermediate date driving wheel turns the date-driving wheel. The date-driving wheel has two arms on it to engage both the day and date disc. The only other thing I wanted to point out about this watch are the shock springs. They are called Diashock. They are very easy to work with. Just twist the spring in one direction or the other (of course covering it with a buff stick) and it will lift up. Putting it back in is very easier-at least more so than Kif. The downside to them would be flinging them if you aren’t careful. There are roughly 4 parts (excluding screws and clips) that make up the automatic mechanism. There are two reduction wheels, the pawl and the ratchet wheel. The set-up is pretty simple. Take a look at the picture again, I have labeled the requisite parts. The post in the center is where the rotor sits. The rotor has a “wheel” section to it that has teeth that engage the first reduction wheel. The first reduction wheel has a long post that the pawl arms clip to. The pawl sits off-center just a little bit. The pawl arms have a single tooth that rests between two teeth of the second reduction wheel. The second reduction wheel has teeth on the underside that engage the ratchet wheel. The ratchet wheel and the second reduction wheel can and only move in one direction. The ratchet wheel turns clockwise, the second reduction wheel turns counter-clockwise. 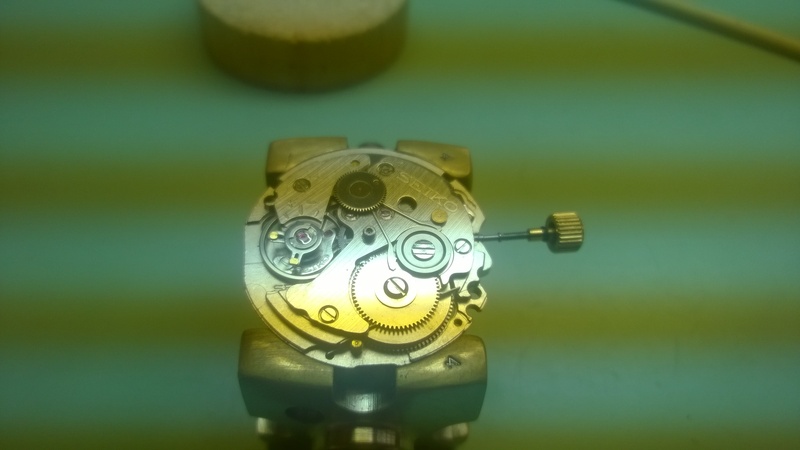 The movement of the second reduction is caused by either a pushing or pulling of the pawl arms. 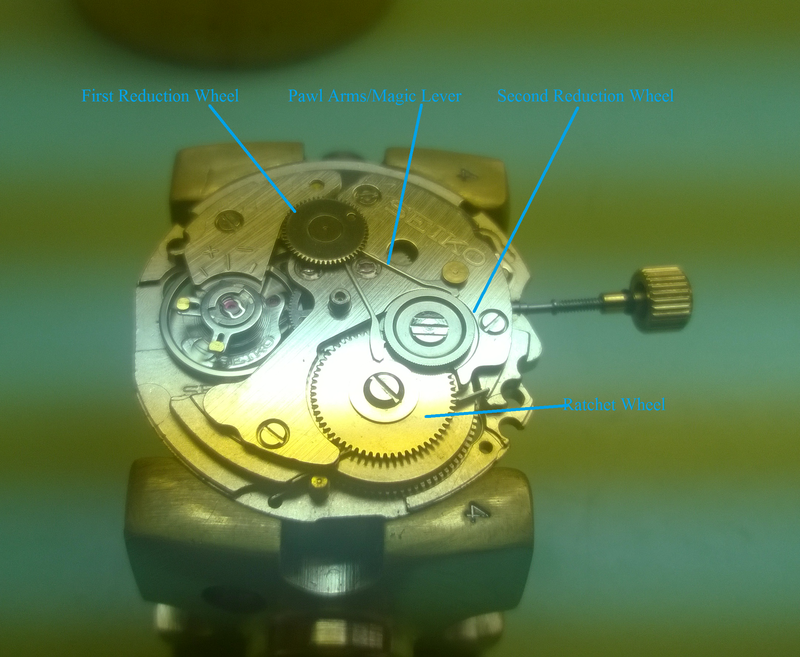 Using the labeled picture as a reference, the left-arm of the pawl always pushes the second reduction wheel and the right arm always pulls; as to which happens first (the pushing or pulling), that is determined by the direction the first reduction wheel is moving. If the wheel is moving counter-clockwise, the pawl will pull and the pulling motion is finished with a push. When the wheel moves clockwise, it will push first and finish with a pull. I have a video that should hopefully help make that clear. One last thing that I liked about this watch that was simple was the click. If you look at the labeled picture again, you will see a straight bar going across the top of the barrel, underneath the ratchet wheel. That is the click.. It’s not held in place under tension, no weird shaped spring, no screws. It slides between the plate and the brass post and that is it. Amazingly simple, again. Beyond that, it was a pretty standard watch. Say what you want about the use of plastics in the watch, but any negative comments you can make about this movement will be overshadowed (in my opinion) by the simplicity of the automatic mechanism. 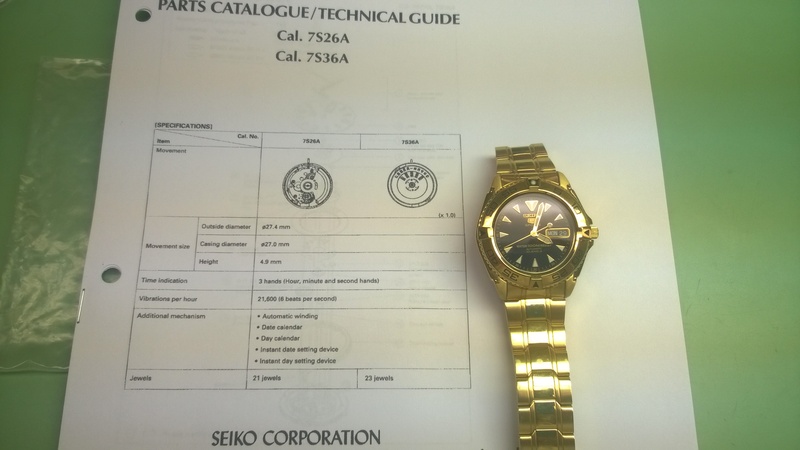 i need seiko spare parts in turkey? I wish I could help you source parts locally. You best bet would be to check Otto Frei, Cousins UK or even Ebay. If Ebay, you may have to look for a spare movement to take apart.